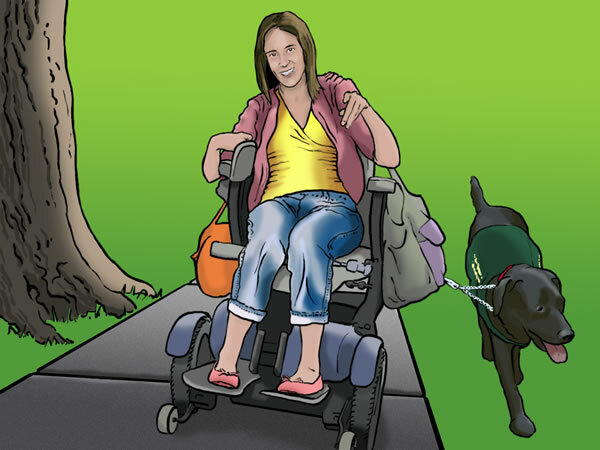 Emily is one of the personas from our book, A Web for Everyone. Personas combine research data from many sources into a fictional but realistic character. They are a great way to make sure your team considers the diversity of needs among visitors to your site. You can download an overview of all eight personas from our Resources page. The personas images, created by Tom Biby, twofinechaps.com, are available on Flickr. Tune in for a new persona every Tuesday until all eight are posted. Emily is determined to do things for herself, so she’s tried a lot of different keyboards and joysticks over the years, looking for the right kind of interaction. Speech is difficult for her, so she uses a communications program with speech output. It’s slow for her to type with limited use of her fingers. She has stored many phrases and sentences, and can make the program speak for her more easily. The iPad turned out to be one of the best solutions. Mounted on the scooter, it’s always within reach, and touch works better than a keyboard and a joystick. In some situations, it can replace her older communications program. 800,000 children and adults in the U.S. have one of the forms of cerebral palsy. People with disabilities are often unemployed or underemployed. Among all U.S. working age (18–64) people with disabilities, only 21% are employed full- or part-time.